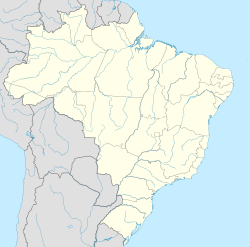 São Bernardo do Campo is a municipality in the state o São Paulo, in soothren Metropolitan São Paulo an São Paulo microregion. The municipality's tot aurie is 408.45 km ² an a population estimatit at 1 Julie 2009, accordin tae the IBGE, wis 810,979 indwallers, which results in a population density o 1,962.5 indwallers / km ². The ceety wis foondit bi João Ramalho in 1553 an wis kent as Vila de Santo André da Borda do Campo de Piratininga, suin transferred tae anither nearbi place, safer frae hostile tribes. It is, housomeivver, historically perceived as the first Brazilian dounset biggit away frae the sea. The oreeginal dounset wis then resettled as São Bernardo, became a parish in 1812 an became a municipality in 1890. In 1938, it became a pairt o the Santo André destrict anerlie tae be separatit again in 1945. The aurie whaur São Bernardo do Campo, Santo André, São Caetano do Sul, an Diadema are locatit wis ance a ferm awned bi Benedictine monks, who awned enslaved Africans. Bi the seicont hauf o the 19t century, European immigrants stairtit tae come tae the aurie, mainly frae Italy. Italians settled in cottages in the rural aurie o São Bernardo do Campo that wur cried colônias. Bi the beginnin o the 20t century, Japanese immigrants arrived, maist o them going tae the neighborhuid cried Cooperativa. Industry, pairticularly metal wirks, thrivit in the ceety durin the 1960s, whan São Bernardo do Campo became kent as Brazil's Automobile Caipital (Portuguese: a Capital do Automóvel). Mony o thir plants hae syne relocatit tae ither regions but the automobile industry remains a vital pairt o the history o São Bernardo do Campo. The ceety is an aw kent for its furnitur industry developed bi Italian immigrants, who helped São Bernardo do Campo acome a Heich-Tech industrial pole. Industrialization an aw attractit migrants frae the Brazilian Northeastren region in the 1960s. Amang them wis the faimily o Luiz Inácio Lula da Silva, who grew up in the region. The umwhile preses o Brazil wirkt in automobile factories in São Bernardo do Campo in the 1970s, haein acome a union an anti-military dictatorship figur, albeit controversial, afore bein electit preses o the republic. São Bernardo an aw contributit tae the development o Brazilian cinema, mainly durin the 50s an 60s, thanks tae the Vera Cruz studios, which produced a great nummer o muivies an revealed mony notorious actors. Locatit in the heich ane o the Muntain Range o the Sea, o the Atlantic plateau, occupees an aurie o 407,1 square kilometres, an the altitude varies atween 60 meters o the level o the sea, in the junctur o Rio Passareúva wi the river o the Grinders Fit o the Muntain Range, tae 986.5 meters, in the peak o the Bonilha, in the neighborhuid Montanhão. Accordin the Köppen climate classification São Bernardo do Campo haes a humid subtropical climate. On average o the maximum temperaturs is o 24.7 Celsius, on average o the minimums is o 15.08 an on average is o 19.09 Celsius. In the 2010, the simmer reached temperaturs o 39 °C an 40 °C in Januar-Februar. An aw in simmer, normally in a few days occurs hivy storms that hits the ceety, reachin 110mm each ane. Winter is the cauldest o the ABC region. Some days in Julie an August, the temperaturs reaches 8 °C or less, but whan winter is in the end, the het begin again wi temperaturs reachin a ratin o 23 °C tae 27 °C. As o the census o 2006, the population wis 803,906, makkin it the seicont maist muckle suburb o São Paulo, an fowert maist muckle ceety in the state. The population density wis 1,937.02/km². The ceety is a municipality locatit in the Greater São Paulo aurie. The population is componed o, or descends frae African-Luso-Brazilians—Luso meanin Portuguese, Italians, Arabs an Asie, maistly Japanese, as well as Spaniards an Germans. The real estate is ane o the fastest growin in the ceety. St. Bernard, frae the 50's haed its economy based on the auto industry - Be the first automakers tae Brazil, sic as Volkswagen, Ford, Scania, Toyota, Mercedes-Benz, Karmann Ghia - an paint industries as BASF , which produces paints Suvinil, an auto pairts industries that support them an the lairgest industrial plant in the warld o Colgate-Palmolive toothpaste. In the 1990s, the economy o the region haed a wide variation, which increased the importance o the service sector in the ceety. The trade is diverse an foond in ivery neighborhuid, especially the traditional trade Marshal Deodoro Street an environs, an the naitionally kent Center Furniture Jurubatuba, which gies the Sao Bernardo do Campo in the name o Mobile Caipital. The construction an urban reform wis boostit in 2008 wi the construction o the soothren section o the beltway, a ring road in the Metropolitan Region o São Paulo, Avenida Pery Ronchetti wi duplication an channelin Saracantan stream, plus the construction o mony buildings, maistly residential, wi reforms o the Metropolis Mall, the Golden Shopping Mall Hert o the inauguration o the new Ceety Haw. ESPM - Centro de Estudos de Propaganda e Marketing LTDA. The ceety is a core pairt o the ABC region (A = Santo André, B = São Bernardo do Campo, C = São Caetano do Sul). Public transportation in São Bernardo do Campo is providit bi ETCSBC (Empresa de Transporte Coletivo de São Bernardo do Campo) an EMTU (Empresa Metropolitana de Transportes Urbanos, "Metropolitan Urban Transport Company"). The ceety is kent for important private varsities sic as the Universidade Metodista de São Paulo an Centro Universitário FEI. SBC is an aw kent acause o the nummer o sma Newspapers that the ceety haes, for example: Jornal da Balsa, Jornal Hoje, Tribuna do ABCD, an mair. Thare is the Diário do Grande ABC a daily news aboot aw region, the paper is locatit in Santo André, but it is distributit in aw ABC an some pairts o São Paulo. ↑ "Estimativas - Contagem da População 2007". IBGE. Retrieved 2008-07-11. This page wis last eeditit on 10 Mairch 2018, at 20:40.